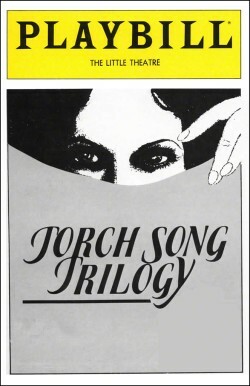 Torch Song Trilogy is a collection of three plays by Harvey Fierstein rendered in three acts: International Stud, Fugue in a Nursery, and Widows and Children First! The story centers on Arnold Beckoff, a Jewish homosexual, drag queen, and torch singer who lives in New York City in the late 1970s and early 1980s. After eight previews, the Broadway production, directed by Peter Pope, opened today, June 10, in 1982 at the Little Theatre, where it ran for 1,222 performances. The cast included Fierstein as Arnold, Paul Joynt as Alan, Court Miller as Ed, Fisher Stevens as David, and Estelle Getty as Mrs. Beckoff. The award-winning and popular work broke new ground in the theatre according to Charles Busch in The Advocate: "At the height of the post-Stonewall clone era, Harvey challenged both gay and straight audiences to champion an effeminate gay man's longings for love and family." 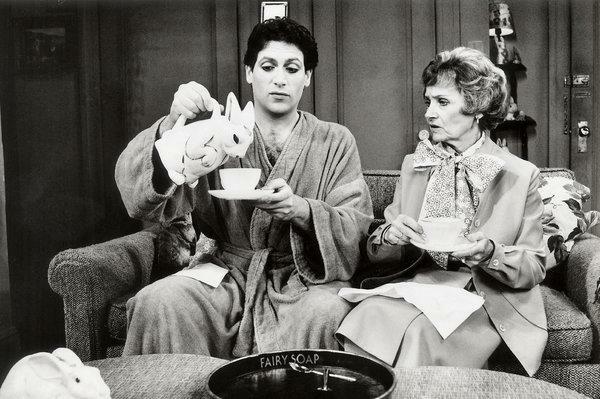 The play won Fierstein two Tony Awards, for Best Play (with John Glines' historic Tony speech that acknowledged his lover and co-producer Larry Lane) and Best Actor in Play; two Drama Desk Awards, for Outstanding New Play and Outstanding Actor in a Play; and the Theatre World Award. In the fall of 2017, a revival called Torch Song it was produced by Second Stage Theatre, in New York City, with Michael Urie as Arnold and Mercedes Ruehl as Mrs. Beckoff. The Urie-led production is scheduled to transfer to the Hayes Theater on Broadway in November 2018. The scene below is from the 1988 film of the play.